Our search for Anne Bradstreet is underway, and we couldn’t be more pleased to share our journey with everyone! The start of our archival adventures took place at the Phillips Library’s new facilities in Rowley. While at the Phillips Library, we were able to examine two documents written by Anne’s husband, Simon Bradstreet, in addition to other seventeenth and eighteenth-century materials. One of the documents, an original, written in Simon’s own scratchy scrawl, pertains to the boundaries of Andover and Reading. Simon’s handwriting is extremely difficult to read, and the smudges and water damage certainly don’t help, but once we are finally able to make sense of it, it will be a great help in our endeavor. Document of Committee of Andover, 1658. MSS 0.247. Phillips Library, Peabody Essex Museum, Salem, MA. The second document of Simon’s was his will. This document was not an original, however—but thankfully, had already been transcribed. Reading Simon’s will was incredibly eye opening. Until our trip to the Phillips Library, I did not realize just how wealthy the Bradstreet family was. Simon owned land across Massachusetts, including a small island "lying intirely betwixt the River and a certain Brook there" near Topsfield, Massachusetts. We also learned that the Bradstreet family owned slaves, which is something we had not come across before in our studies. Their names were Hannah and Bilhah, and they were willed to an Anne Bradstreet (his second wife) upon Simon’s death—but little more is known about their lives. This information may be chilling and disappointing to modern audiences, but it is crucial to shed light upon the full range of power structures and systems in which the Bradstreets were enmeshed. Far from being isolated in the American wilderness, Simon Bradstreet conducted business at home and abroad—and benefited from the transatlantic slave trade. Keeping our archival adventures alive, this past week, half of our research team visited the North Andover Historical Society. Our visit was everything I could have hoped for, and we are all tremendously grateful for the help the North Andover Historical Society has been to us. Thanks to the North Andover Historical Society, we now have access to the most up-to-date research regarding the Bradstreet family and seventeenth-century North Andover. Carol Majahad, executive director of the North Andover Historical Society, gave us guides to seventeenth-century handwriting, which will allow us to finally transcribe the Simon Bradstreet document from the Phillips Library, and a copy of a seventeenth-century North Andover map showing where Simon Bradstreet’s land was. Finding exactly where Anne and Simon lived at the time of her death could be the key to finding her burial site. 1655 Map of Andover [Modern Approximation], North Andover Historical Society. Majahad also shed light on the limitations of the existing seventeenth-century archive. 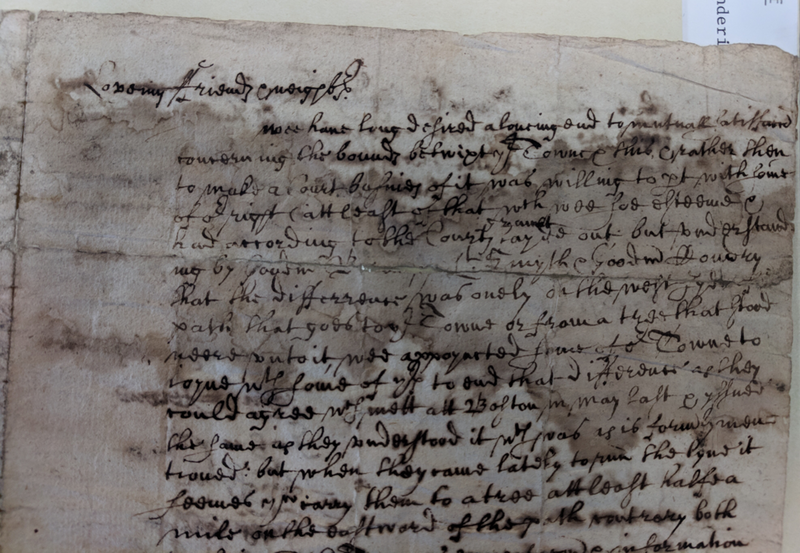 Though Anne Bradstreet and her husband were leading members of their community, there aren’t many written records from their, and particularly Anne’s, lives—a phenomenon that is true of other seventeenth-century figures as well. Paper was scarce and expensive in the colonies, Majahad told us. Records of some colonial officials were destroyed in King Phillip’s War and others in King William’s War. These major conflicts in seventeenth-century New England and their effect on the archive are another reminder that the Bradstreets’ lives were embroiled in the global conflicts of their day. Other seventeenth-century records have since been lost to time, neglect, and deterioration. In some ways, these documents were doomed to succumb to time—the iron gall ink used to write was very acidic, causing corrosion over the years. Knowledge of archival precarity makes the records we do encounter seem all the more special. This upcoming week, the rest of our team will visit the North Andover Historical Society to follow up on what we have found so far, and seek out other information we may have missed on our visit. Follow our progress on Twitter, Instagram, and Facebook! Isabella Connor has been fascinated by history and literature for as long as she can remember. She has worked as a tour guide at Salem’s famous House of the Seven Gables, and has a passion for bringing history to the public. Isabella also works for Merrimack College’s English department publication, The Broadsheet, and is a fiction writer on her own time.